Wake Up, People! We’re Not Full-Bodied. We Are FAT! 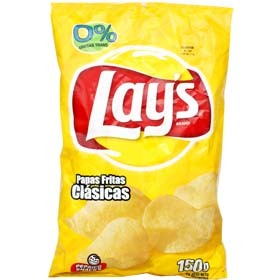 As is the case with many things and ideas of late, inspiration for this installment came as I sat on my comfy couch, papas fritas (potato chips to you who haven’t read the bag lately) and a cold one at the ready, watching the tube. One of those basement-produced As Seen on TV! ads came on—this one for the patented and groundbreaking Furniture Fix. Have you seen this? The product of higher minds than mine, Furniture Fix is a set of six interlocking plastic panels you place under your sofa cushion to prevent unsightly and uncomfortable sagging. (And if you order in the next 20 minutes, you get a second pair for only shipping and handling! Go, man, go!) 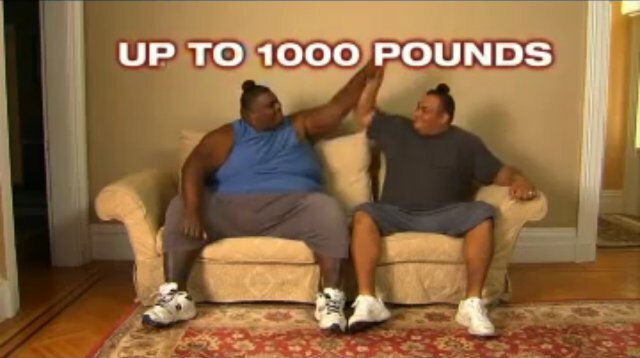 In the television ad, two gargantuan “sumo wrestlers” are enlisted to sit on an unfortunate couch bolstered by the patented Furniture Fix supports. Guess what? No sagging! The thing is—and this is what got me thinking—these alleged sumo wrestlers didn’t actually appear much larger than a lot of folks you see on the street today. Hmmm. Ya see, the crafty sales folks for Furniture Fix realized they needed to present these two sofa-sitting behemoths as “sumo wrestlers” so as not to offend the general public. Truth is, a great many people in the good ol’ U.S. of A. are . . . let’s call it oversized, these days. We used to term this condition “fat,” but this is the era of tender-stepping political correctness. Generously proportioned is what we say now. Full-figured. Adipose-enhanced. I say damn the PC torpedoes; I’m calling a spade a spade. Wake up, people! We are FAT. And you know why we’re fat? Simple, really. In the old days, when work meant work, folks on farms, in construction, heck, even in office settings did much more actual, physical labor. As in walking, lifting, moving about. Not so today. And the food we once consumed was mainly fresh, not prepackaged, flash-frozen, and deep-fried. Does anyone hear that song “In the Year 2525” by Zager and Evans wafting in the background? Now, don’t get me wrong. I recognize genetic predisposition; I understand about medical conditions; I’m taking into account infirmity and unavoidable circumstance. However, by and large (pun! 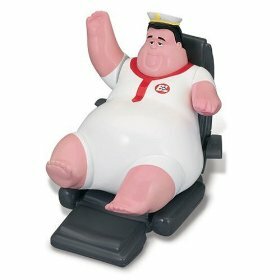 ), we have become a nation of lazy, lard-addled lumps of lifeless inertia. America, being the keen capitalist nation we are, of course, caters to our blubbery broadmindedness with all sorts of products and services aimed at making our expanded personal spaces easier to manage. If you’ve been paying attention, you may have noticed the shift from ads for personal fitness machines to “lifestyle augmentation devices.” In other words, corporate minds recognize that we’ve given up. Companies such as Voluptuart, chunkEbusiness.com, Amplestuff, and many others provide a broad (pun!) range of items just for the, um, girth-gifted. There’s Mr. Big Chair, a portable seat capable of hefting 800 pounds. There are fanny packs with extenders designed to fit any waist size, up to and including Andre the Giant. They have hand-held shower sprays specifically for “big people” (which means they come with approximately 27 feet of extension hose). There are pistol-grip remote toenail clippers, long-handled remote shoehorns, even, uh, “wipe extensions” that hold toilet paper. ’Nuff said. One company makes airline seatbelt extenders and titanium hammocks capable of holding many African jungle animals. To add to the mix, our calorie intake has skyrocketed, now at more than 2,000 calories a day compared with 1,800 in the 1970s, according to the Calorie Control Council. Childhood obesity affects almost 40 percent of children in many states. 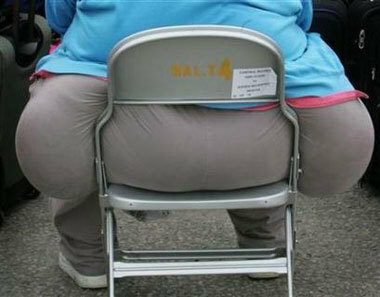 It’s estimated that one-third of children born in 2000 will develop obesity-related diabetes, said ObesityinAmerica.org. Obesity now impacts 17 percent of all children and adolescents in the United States—triple the rate from just one generation ago, according to the Centers for Disease Control and Prevention. This is truly scary. I remember when I was in elementary school (eons ago), there was an average of one fat kid per class. We called him, affectionately, the fat kid. I wonder, do today’s childhood classrooms have one skinny kid they affectionately call the beanpole? Urgh. My chips and brew don’t look so good all of a sudden. I’m sorely tempted to find my tennis shoes and go for a brisk run. Almost. But gads, it’s so hot out. And look! “America’s Got Talent” is on in a few. Get me another beer while you’re up. ← Is the Golden Era of Literacy, Like, Dead? Furniture Fix is my new favorite infomercial. Interesting point about the seeming acceptance of the fat phenomenon by Americans. I guess one can have his cake and eat it, too, but the results of that aren’t necessarily healthy. I think it`s very interesting that our success has encouraged our excess. It`s also interesting to see the differences in folk`s size depending on where they live- I`m currently in Japan where everyone is thin from walking everywhere with a diet very low in sugar. Thanks for giving a voice to what is a huge (no pun intended) concern of mine. I am aghast that some people are now using those toilet paper holder extenders. I always thought people should shoot themselves when they can no longer wipe their own butts. This is your best article yet!! Of course you didn’t get into the whole OTHER major issue, the cost of health care rising and “ballooning” out of control in sync with our waist line!! Why should I have to pay high premiums because YOUR FAT?